Oh geez, you're right. We already have over 100 units in the first game, now we're playing with even more units, but no way to take more of them into battle? Bad move, man, bad move. alpha had tons too but it was made better by having multiple 3 way route splits. PV2!! be warned its 13 mins long but its full of awesome! setsuko and rand are back! It's amazing what they've managed to do with the PSP hardware. I can't think of a PSP game with better looking 2D animation. Don't give up on a squad or partner system yet.. they usually announce gameplay stuff last. Although they have revealed quite a bit so far. it seems after the 3rd stage theres a 4 way route split. Then bloody 4 way branch. With the higher res scans I can actually see what the words are. The third route split is not China, but Middle East. I'm going to summarise each chapter from the scans, so if you don't want to be spoiled then ignore the walls of text at the end of this post. Fulfilling specific objectives in each of the three prologue stages will determine the difficulty level of the game. There are no SR Points in the prologue stages. Esther's Brasta Es is a prototype of the mass production Brasta. It is highly capable, all-rounded and has the ability to repair. The first real chapter takes place 1 year after Z2-1, and 1 month after the formation of the Earth Federation from the three major power blocs. With the death of Gaiou, it seems that the Dimensional Monsters have become weaker. However, freed from the control of the Imperium, the DMs have gone berserk. Gundam Deathscythe and Gundam Sandrock join in this stage. In the second stage, you learn that the Earth Federation is corrupt hurr durr. Also Kallen joins with the Guren Mk-II equipped with the first type arm after the events at the end of Geass S1 that wrecks the original arm. C.C. also joins in a Burai. In the third stage, they travel of Singapore by Kallen's request. There they meet Ranka who is on vacation and Alto and Luca who are her bodyguards. Also Tetsujin 28. You get the RVF-27 Lucifer (Luca), VF25-F Messiah (Alto) and Brera in his VF-27gamma Lucifer join for a bit. Tetsujin's got no weapons and is a pure melee robot. At the end of stage 3, you get two route splits. 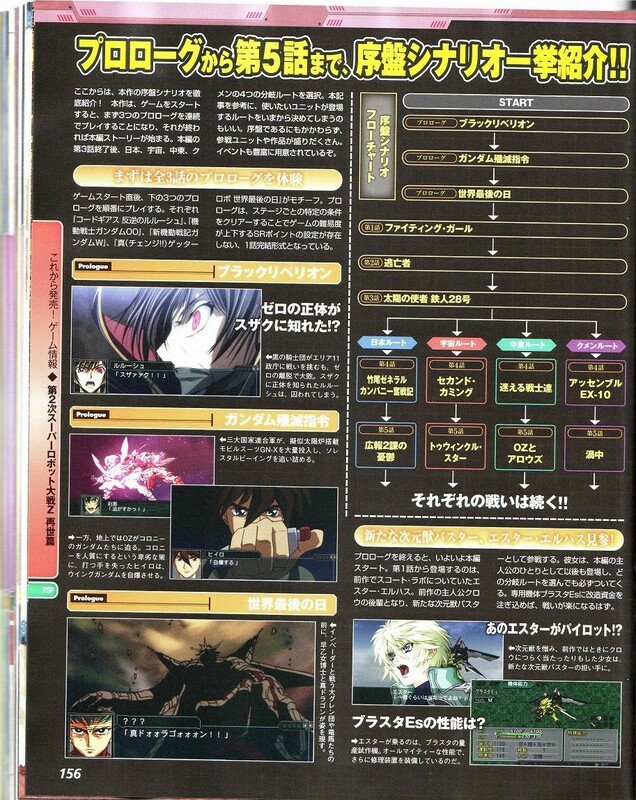 First option is to choose between sending Kallen and her group (the Geass and Wing characters) off and going with them. After the intermission, you get the second split. If you decide to send Kallen off, you get to choose between staying on Earth and joining up with the Crusher Squad or going into space and regrouping with S.M.S. If you decide to go with Kallen, then this opens up the Middle East and Kummen routes. Chapter 4. Turns out Watta is Shotaro's classmate. What a coincidence. Kappei is employed in Takeo General Company. I think some Tetsujin plot happens here. Some robot mafia tries to rob our Takeo General Company and of course fails spectacularly. Garrod in the DX, Gainer and Sara in her Panzer join here. That's because they're employed in Takeo General Company too. Chapter 5. Turns out Saeki has replaced Shirota as tactical advisor for Public Relations Division 2. Then, Heterodyne. Great Knot Punisher's under maintenance, how convenient! Dai-Guard obviously joins in this stage. Chapter 4. Esther doesn't like Alto because he's got girl issues. They run into Vajra. Esther and Alto get rid of their issues after each's words and actions on the battlefield. Also Aquarion is with S.M.S. and on this stage the pilots are Apollo, Pierre and Reika. The other two members of Skull Squadron and the Macross Quarter join up. Chapter 5. Sheryl and Ranka are involved in a collaboration called "Twinkle Project". They drag Alto out to shop. Then a terrorist attack happens and they get kidnapped. In the chaos, there is Setsuna F. Seiei. The Koenig Monster and Queadluun-Rea join up, together with the Exia Repair. Chapter 4. We head to Azadistan, where the Colony Gundams have been spotted. A-Laws forces disguised as terrorists come. It's an excuse for them to conduct an armed intervention in Azadistan. Knowing this, Heero and Trowa come out from the circus tents they were hiding in, Heero in the Leo and Trowa in the Heavyarms. Chapter 5. Quattro, Kamille and Shinn are under Zechs' squad. Treize is moving alone. This is a trap to lure Duo and the other Gundams out. They enter the trap knowingly. Apparently Wufei hates Treize. Chapter 4. The people from Astranagius have founded a new country on earth - the Kingdom of Kummen. Kallen and gang go to Kummen to make money for the Resistance. There they meet Chirico and Gotho. Chirico's Marshydog, Potaria, Kidera and Kan Yu's Diving Beetles and Ru Shako's Berserga join this stage. Chapter 5. Chirico is convinced Fyana is in the blue AT. Then, DMs appear near the base. While they're wrecking the DMs, the Veela guerillas surround the party. To confirm the identity of the blue AT's pilot, Chirico takes some unusual measures. Also, Kallen is made to wear a bunny suit and work in Club Phantom. Also, special bunny suit cut-in for this stage. No new units /quote]join.[. Man, most of those route splits sound like they'd be worth going through. It'll be hard to choose between Tesujin-28 exploding everything it touches, Chirico and his mighty Marshydog, and Ester calling out Alto on his wishy-washy cockblocking of his ladies + Exia Repair. The only one I'd lose no sleep over for passing it up would be the Gundam one. Does completing the game unlock anything? Extra modes, maybe? http://www.youtube.com/watch?v=npuw2ftJfd0 -- Starting with Hobo Gundam Exia Repair. Unfortunately, I've heard no word on it sticking around. http://www.youtube.com/watch?v=zCY6WWcTrzM -- Next is Tetsujin 28's attacks. I've noticed how enemy machines start to break up when they get shot down. http://www.youtube.com/watch?v=iO-ZRVSNLzI -- The new OG unit's attacks. Basically a copy of Z2-1's OG unit but with a different coat of paint, the lack of kibble switching during attack animations, and a pilot who can actually aim worth a damn. http://www.youtube.com/watch?v=g8Npy3ilQyU&feature=channel -- Super Version Librasta. You get a choice later on that basically determines which of these units you get later on. Additionally there's talk of secrets if you can get Macross F's Alto up to 70 kills by a certain point (you get the Red VF from the movies if you do this), additionally the sole secret unit from Z2-1 is back but it looks like you have to recruit her all over again. Additionally it sounds like you can spare Shin Mazinger's Blue Danube in stage 7 (Japan Route) by talking to it with Tetsujin. Mechanics wise this game seems to hurdle the bar on brokenness as your pilots now have room for EIGHT skills instead of six, of which, Continuous Attack remains and SP Regen makes a return plus a new skill called something like SP Get(?) that nets you 10SP per kill per turn. Basically you get 10 SP back after killing your first enemy for that turn preventing such abuse like dumping all your SPs into Spirits and then reclaiming it all back on a CA murder spree or a souped up MAP attack. The good news is that the game has provided some better variation on the Skill Point requirements like having everyone score some kills on a map. As for standouts in the individual units I've seen thus far we've got CG's Lulu's Shinkirou which is a defensive beast with a shield that can nullify up to 4000 HP worth of damage (to put this in perspective, out of the box grunt units would get one-shotted by that kind of damage) plus a hilariously long range sniper rifle and a massive MAP attack (and then Lulu gets his Ace bonus of a random spell on himself at 150 Will and is not limited by his spell list), then there's Macross7's Basara and his Dynamite Explosion upgrade song that grants all allies within his song's range Gain & Luck and if Basara has Hot Blood active on him so will all his targets (and he gets a combo attack with Gamlin who I believe is from Orguss), and 00Gundam's Setusna still has his 1.5x damage to all solar furnace using enemies from Z2-1 except this time almost everybody from Gundam and Code Greatass is sporting one (and then he gets the 00 and all the hilarity that it eventually sports). Don't get too attached to Ester as she winds up ditching for about a third of the game (though she does come back near the end). At the very least it sounds a lot more optimistic then what apparently happens to Setsuko over the course of the game (par for the course at this point), but I currently lack the specifics as to what this entails. And for those who were waiting to see Gurren Lagan's finale's over the topness are bound for disappointvile (the best you're getting is a anti-GL unit that you free Nia from; no ArchGL or galactic shurikens).